About 200 metres away from the western end of the camp street is a large administration building, the former staff building, also called the T-building because of its shape. It was built in 1937/38 by Sachsenhausen Concentration Camp prisoners and was then extended by a diagonal wing. The Concentration Camp’s Inspectorate and the head of the SS Totenkopfverbände (SS Death’s Head Units) was located here starting in 1938. The relocation of the central administration of all concentration camps as well as of the head staff of the concentration camps’ security forces and of the SS dispositional troops to Oranienburg underscores the leading role which the Sachsenhausen Concentration Camp was given in the concentration camp system. Moreover, in the following years, the building provided space for further SS infrastructure, as in, for example, the “Waffen-SS (Armed SS) Section for Research on War History” as well as being used to house 80 to 120 SS family members. From 1934 to 1939, the Inspectorate was directed by Theodor Eicke and then by Richard Glücks until April 1945. The “desk perpetrators” at the Inspectorate played a decisive role in the carrying out of the genocide against European Jews and Sinti and Roma. They coordinated the mass murder of the Soviet war prisoners in the concentration camps and the systematic murder of sick prisoners. All of the mass murders, as well as every individual dead prisoner, were registered in this building. The Inspectorate determined prison conditions and hunger rations, forced labour and prisoners’ punishments. It was here that the systematic terror in the camps was bureaucratically planned. The concentration camps’ prisoners’ forced labour for the German armament industry was centrally managed here as well as the coordination of the exploitation of the inmates and their “extermination through labour”, after the Inspectorate became part of the “Main SS Economic Administrative Department” as “Departmental Group D” in 1942. Administrative duties and bureaucratic activities – file memorandums, statistical analyses and executive orders – had a profound influence on the character of the daily routine in this building. The centralised and efficiently functioning bureaucracy in the Inspectorate was juxtaposed to the unrestrained violence and despotism which was occurring outside in the camps. These two elements do not contradict one another, but rather complement each other; it was the combination of the two which created the system of National Socialist terror. The Red Army and then the National People’s Army of the GDR used the building from 1945 to 1990. For this reason, its historical importance was almost forgotten. However, there are now offices of the Foundation for Brandenburg Memorial Sites and the Oranienburg Fiscal Authorities located here. 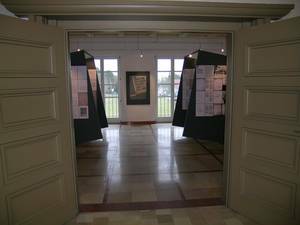 The documentary exhibition is housed in the offices of the highest official of the entire concentration camp system. For the most part, this room has been kept in its original condition. Using photos and documents, the exhibition demonstrates how the concentration camp’s Inspectorate Office worked as the administrative headquarters of terror and provides portraits of a few of the “desk perpetrators” who worked here. The exhibition begins with the building and expansion of the Concentration Camp Inspectorate under the direction of Theodor Eicke. When the war broke out in 1939, this led to a rapid increase in the number of concentration camp prisoners. The Concentration Camp Inspectorate organised both the mass murder of Soviet war prisoners as well as the mass murder campaign called “14 f 13” which was perpetrated against the allegedly sick prisoners. The forced labour which was conducted by concentration camp prisoners and centrally coordinated by the Concentration Camp Inspectorate became a central focus after the integration of the Concentration Camp Inspectorate into the Main SS Economic Administrative Department. The genocide of European Jews was not only organised in close cooperation between the Reich Main Security Office and the Concentration Camp Inspectorate. In fact, every delivery of Zyklon B, the poisonous gas used in the gas chambers, required a “transport authorisation” from the Concentration Camp Inspectorate. Medical experiments conducted on concentration camp prisoners are also discussed in this exhibition. These experiments had to be approved by the director of the “Medical Corps and Camp Hygiene” department, who was also the head supervisor of all camp doctors.